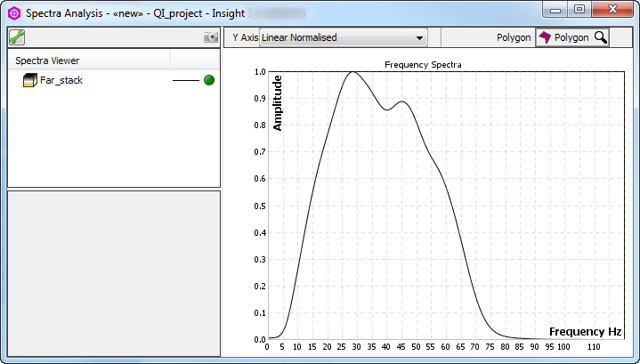 DUG Insight User ManualFrequently Asked QuestionsFrequently Asked Questions Spectra AnalysisWhy does the amplitude spectrum not show deeper peaks and troughs as expected? When trying to display the seismic amplitude spectra using Spectra Analysis, you may notice that the resulting wavelet does not resemble a typical spectrum. This is because the frequency spectrum generated is, by default, smoothed to give you a better picture. This setting can be changed by clicking the spanner icon and disabling the Smoothing enabled check box (see also Configuring View Settings). This should reveal the deeper peaks and troughs that is expected (see image below). Prev: How do I find the RMS amplitude for a single trace over a given time window? How do I do this with a synthetic? Next: Why does my Kingdom survey appear with a different spacing in Insight?